After last night, whoooheee, I am a little rough this morning. I get up early and drink about 60 ounces of orange juice. Ok that's a little better. Leveling out. You know what else makes me feel better? 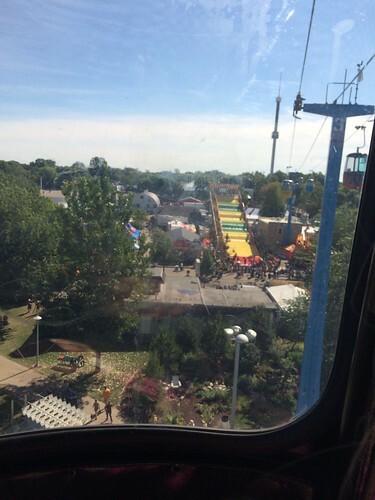 THE FAIR. I like to call it "The Fair of the Dog that Bit You" cure and it works every time. My parents have slept over and are coming with us this morning! As we're drinking coffee and packing up, we find out that Bella is upset that she is NOT GOING TO DAYCARE. It is apparently pajama day. Which she waits for all summer. We work out a plan where she goes to daycare for an hour to soak in all the pajama-y goodness while we get our act together. We drink a pot of coffee, which I remember at the last minute to swap out the chocolate chip cookie dough flavored beans (delicious btw!) for regular, whew that was a close call on almost killing my dad, then we are finally ready and we are OFF by 9:15 am!! Prior to this, I have studied how to deposit mom--whom I don't want to wear out right away with her new bionic knee--closest to the Fair. I decide the hot ticket is Gate 9, the Como Ave Loop Gate. And let me tell you, that was slick! I highly recommend that for your bionic family members. 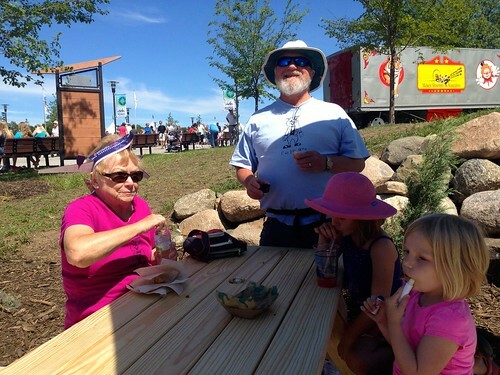 I park on campus and meet them at French Meadows, where they are already eating fresh scones slathered in jam and glaze. Then I actually need to run to a pre-scheduled work event at the 4-H building for a couple hours. Leaving my parents unattended with the fair princesses.... this ought to be interesting. First stop, they text me a picture of their new airplane hats. 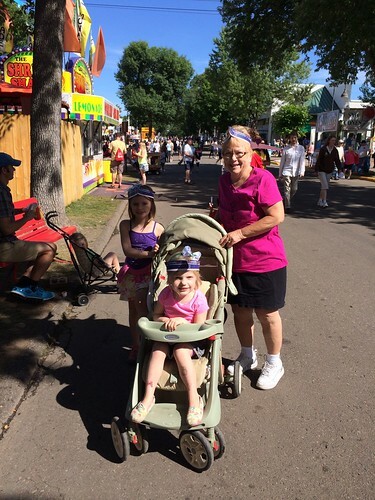 They have gotten three of the highly coveted new hat at the Fair. NICELY DONE, NANA! That probably cost her some miles. Then time for a ride up the Space Tower! 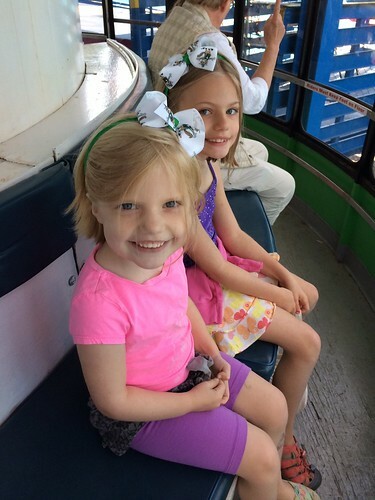 And a roundtrip on the Sky Ride?! 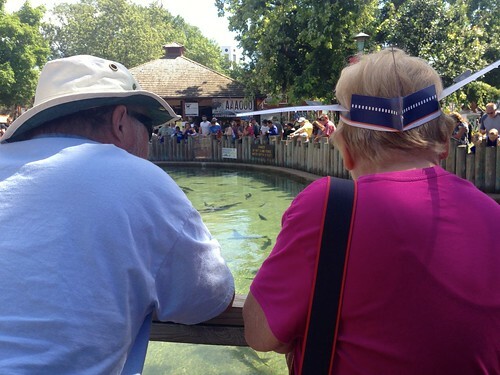 Wow, Grandpa's doin' it up RIGHT. Nana excitedly texts me that they are IN THE POLICE CAR, a text that might alarm other mothers, but I of course knew exactly what she meant. EPIC!! 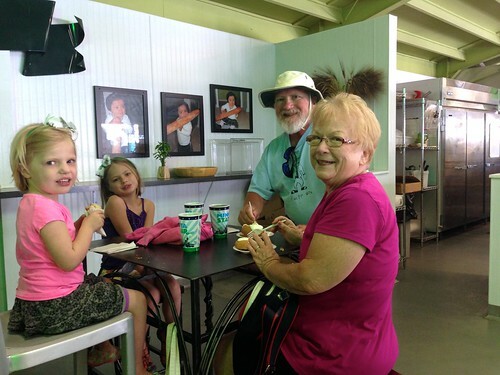 I rejoin them around noon at the butter heads where they are eating ice cream. We decide to mosey over to the DNR building, which my dad loves. 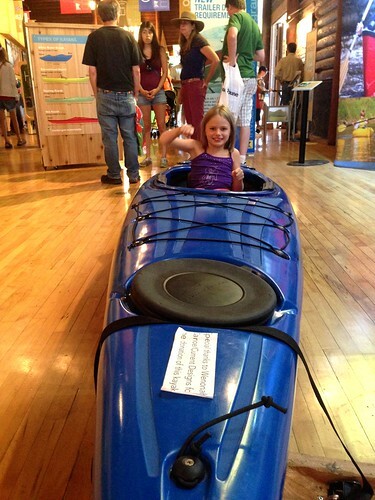 Bella finds a kayak. That's my girl! 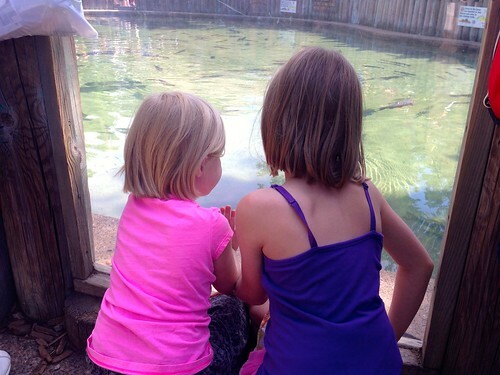 We watch the fish pond. I have no attention span for this fish pond, but apparently I am a genetic mutation because all the rest of the fam is very entertained. Have I mentioned this day is GLORIOUS Fair weather? Like set the thermostat at PERFECTION. 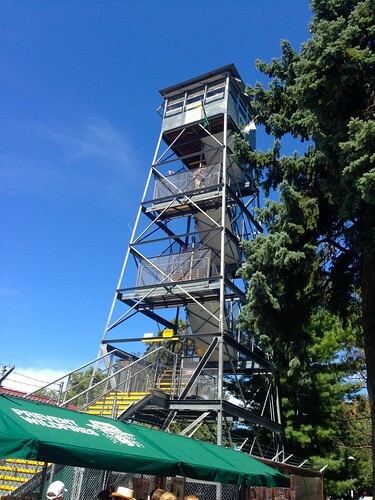 We decide to climb the fire tower! Bella climbs it twice, once with Grandpa and once with me. Go Bella go! Mimi was very scared but she made it to the top and was so proud! My brave little toaster! After a couple of tower climbs, we saunter over to the new West End, which I am very excited to show my dad, with the museum and the street car arch and all that. He went to the Fair like a hundred years ago so I figured he would appreciate it! I asked him if he remembered coming in under the street car arch, and he says he never came in the main gate, he always snuck in over a fence! Poor dad grew up poor!! 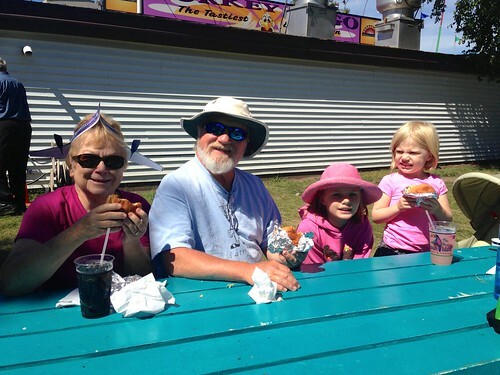 And look at us now, eating $10 blue cheese and corn fritters and LOVIN' EVERY MINUTE OF IT. Notice Mimi has collected a free chapstick so she is just enjoying eating that instead. 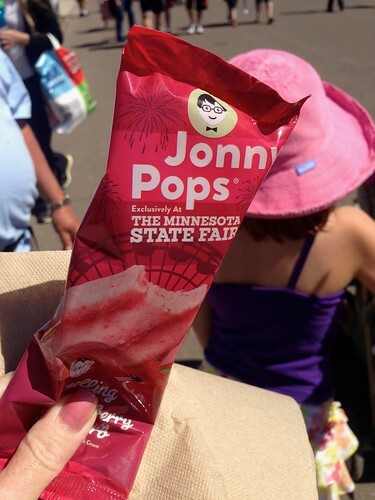 We try the new Jonny Pop popsicle special State Fair flavor, "Snelling Strawberry Rhubarb," and it is awesome! I hope that is a new permanent thing! After you eat it, the stick has written on it for me to walk rather than drive. Which I find pretty presumptuous and pompous. Who do you think you are, stick? YOU DON'T KNOW ME. But then I read on the back that the sticks always have an idea for "paying it forward." Oh. Okay then. Carry on. Now it's time to get into parade position. Bella's noodle meter is running dangerously low so we stop at Italian Junction for a bowl of kids spaghetti. We watch the parade in front of Ball Park Cafe and it is lovely. I apparently took no pictures which is very unlike me! My little Mimi is my rootbeer buddy. 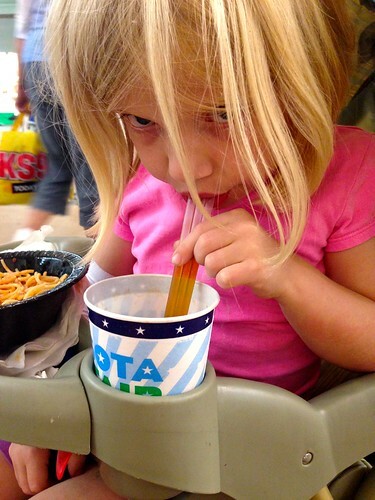 I get her a 1919 and she mainlines it through 3 straws. At this point, Bella is getting what we call FRAGILE. I don't know what's going on. She's fed, watered, rested, paraded. She is wanting daddy (at work) and is overall kind of weepy. Hmmm. I keep feeling her head. No fever. No fever. Then, FEVER! Darnit. I give her an Advil out of my purse, we call Brent at work so she can talk to him, then we lay her down on a bench in the Hort building and she naps for a while. Mama Fair hobo style. That's my girl. We consider going home. But then after about 45 minutes the miracle of Advil occurs and she perks up. 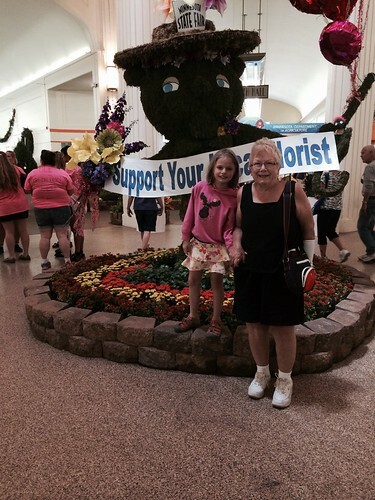 When she is starting to feel better, she shows Nana the Fairoline topiary. We stop at O'Gara's so my parents can try the pretzel cheese curds. Mmmm! 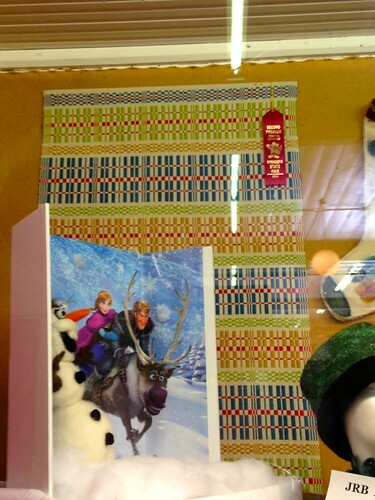 Then we walk through Creative Activities. Here's some of my favorites. 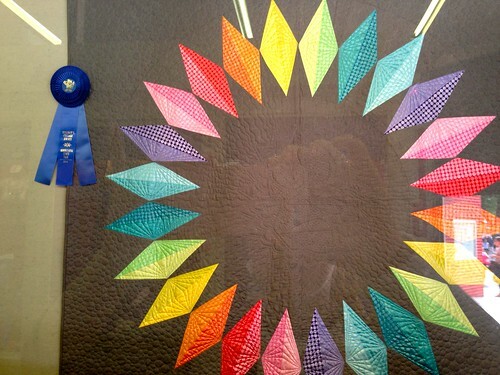 Amazing quilt. I love the dark gray background. Monks belt weaving, the colors here are perfect. 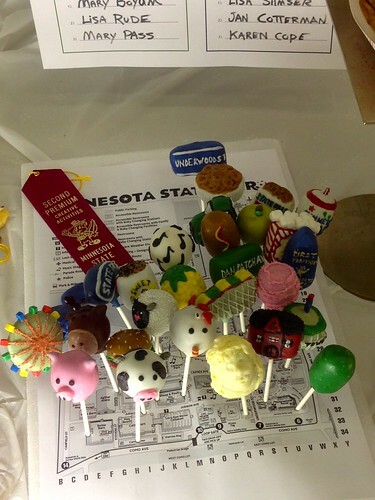 State Fair themed cake pops. We looked at these for like 15 minutes! Tons of detail!! There's a butterhead, the new arch, a bucket of cookies, the haunted house, the giant slide, etc etc. And did you notice, they are all stuck into the Fair map corresponding to where they are located! Amazing. That red ribbon is a CRIME. Peppercam gives it a Purple! 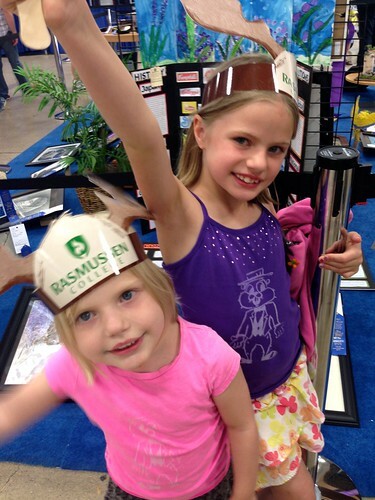 The girls get moose antlers in the Education Building. I text Brent this picture as evidence that Bella is feeling much better. 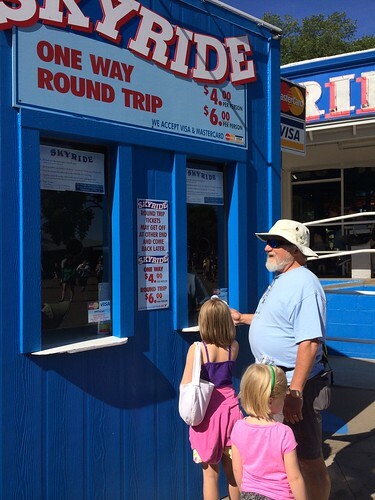 Next we hit the Giant Slide--a tradition with Grandpa! Wheee! Guess I didn't get any pics of that since I was ZOOMING DOWN THE SLIDE. We cruise through the bottom of the Grandstand. My parents are constantly lost from each other and are getting very irritated. 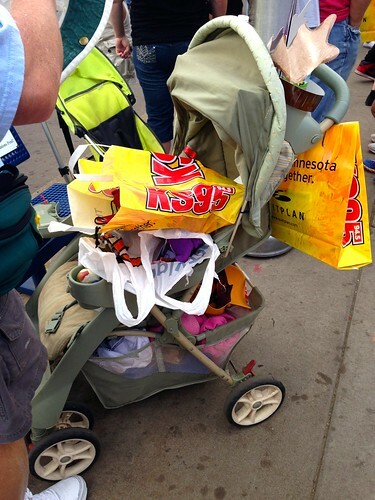 Also this is what our stroller looks like. We decide to call it a day. Riiiiiight after a huge cup of Fresh French Fries. Then I walk my mom (who has lost my dad) back to Gate 9 and Bella and I hoof it back the other way to get the car, circle around, and pick them up. 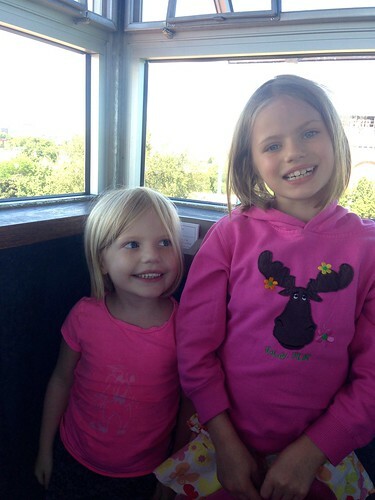 What a great day at the Fair!